For me, Disneyland is a magical place, but, at Christmas time, it becomes extra-magical. From mid-November through early January, Disneyland is graced with countless decorations, including a tall Christmas tree and a winter incarnation of Sleeping Beauty Castle. Two of its famous rides are transformed as well. “it’s a small world” becomes “it’s a small world” Holiday where the cute little dolls dance in a winter wonderland to the song, “Jingle Bells.” The Haunted Mansion becomes practically a whole new attraction, Haunted Mansion Holiday, themed after the movie, Nightmare Before Christmas. A Christmas Fantasy Parade and “Believe… In Holiday Magic” fireworks show, both offered during normal park operating hours, never fail to get me in the spirit. After experiencing the holiday magic at Disneyland, I wanted to see how its east coast equivalent, Walt Disney World Resort's Magic Kingdom theme park, celebrates the Christmas season. In November 2010, when my family spent Thanksgiving in Orlando, I got my chance. 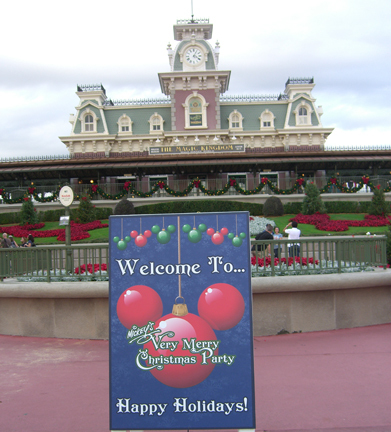 In order to get the full Christmas experience at the Magic Kingdom, I decided to attend Mickey’s Very Merry Christmas Party on November 28th, 2010. The event, whose ticket prices were less than regular admission prices for the park, officially ran from 7PM – midnight, but I heard that I could enter as early as 4PM. I purchased my ticket at my Walt Disney World Resort hotel the day before the party to take advantage of an advance purchase discount. I arrived at the Magic Kingdom at about 4PM on the day of the party and, sure enough, a bracelet was attached to my wrist and I was allowed to enter the park. I picked up a special Mickey’s Christmas Party Magic Kingdom guidemap which listed all of the party entertainment showtimes, the selected attractions that were open during the event, and the locations of the holiday treat stations, where we could get free cookies and hot chocolate once the event began. I was busy riding rides when the party officially began. When I passed by Cinderella’s Castle after dark, it sparkled with small lights that draped over it like blankets of glowing snow. 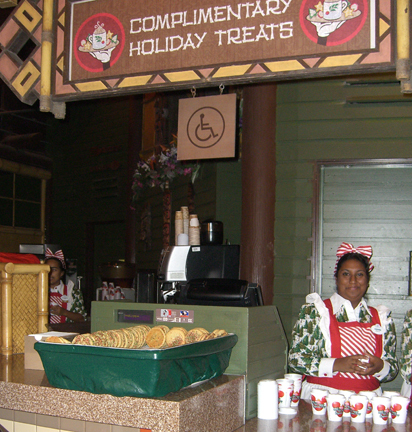 Near a holiday treat station, a cast member invited me over for some yummy soft sugar cookies sprinkled with red and green colored sugar and cup of hot chocolate. 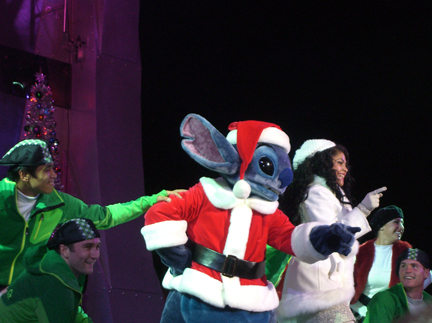 That night, Mickey’s Very Merry Christmas Party offered two live musical shows (“Celebrate the Season” (3 showtimes) and “A Totally Tomorrowland Christmas” (5 showtimes) ), a parade (“Mickey’s Once Upon A Christmastime Parade” (2 showtimes)), and a fireworks show (“Holiday Wishes – Celebrate the Spirit of the Season” (one showtime)). I was determined to see them all. The live shows, “Celebrate the Season” and “A Totally Tomorrowland Christmas," seemed geared toward the toddler and kindergarten crowd. The parade, however, had something for all ages including plenty of Christmas music, elaborate winter themed floats and character appearances, including an appearance by Santa. 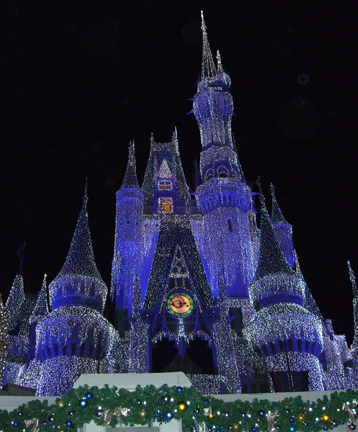 The fireworks show incorporated lighting and projection effects on the castle and fireworks choreographed to holiday music. One thing that I love about visiting the Disney parks is that, from time to time, something fun and unexpected happens. In my opinion, that is the true magic of Disney. That night, as I was walking through the park, a custodian stopped his cart, pulled out his mop, and started to clean the pathway in a way I’d never seen before. With his mop dipped in water, he painted very deliberate curves on the pavement. People gathered around him, watching curiously and guessing about what he was painting. 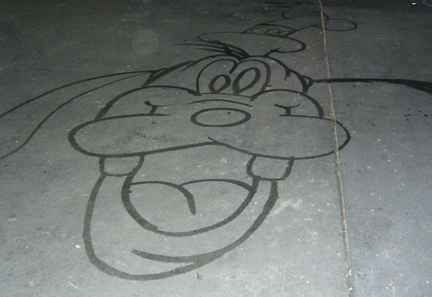 When his masterpiece had come together, we saw an instantly recognizable portrait of Goofy. I wonder if he was a Disney animator in disguise. After catching all of the special Christmas Party entertainment, except the character dance parties, which I later heard were a huge hit with some outgoing young kids, I set out to ride a few more rides before the evening came to an end. As was the case during my entire time at the Magic Kingdom that day, the wait times that I encountered for the rides ranged from practically no wait to no more than twenty minutes. I left the Magic Kingdom at about midnight, after a very enjoyable evening of entertainment and rides, as snow fell on Main Street. It was a beautiful way to end the day. My curiosity about Christmas time at the Magic Kingdom is now satisfied. It is certainly a wonderful place to celebrate the holiday season! I did this in 2010 at Walt Disney World in Orlando, Florida, USA.